Every vehicle owner knows how important it is to check the oil in their car. Maybe you’ll find you’re down a quart and need to add $3 worth of oil. Or maybe you never check your oil. If the oil is neglected for an extended period of time, it can easily turn into a very expensive engine repair bill. Maintaining your hot water heater is also important, but its a sadly neglected duty. Maintenance will cost you nothing but a few minutes of your time, and can drastically improve the lifespan of your hot water tank! Save yourself a headache and some cash by doing some simple regular maintenance on your water heater. Here are a couple hot water tank maintenance tips. Be aware than any work on a hot water heater does require some care and respect for components in use such as natural gas, electricity, hot water (possibly steam), and sharp metal edges. Always wear protective gear such as leather gloves and protective eye-wear. Read through the entire procedure before you start so you know if you’re comfortable performing this maintenance or not. Over time, and with quantities mostly dependant on water hardness in your area, naturally occurring calcium in the water will ‘scale’ and settle at the bottom of your tank. This calcium build up is muddy, sometimes gritty, and commonly known as sediment. Sediment build-up in your tank will lead to many problems, but most importantly it becomes a barrier between the heat source at the bottom of the tank and the water its trying to heat. This barrier forces the tank to work harder to heat the water which further breaks down the integrity of the tank floor. When you hear about the bottom of someone’s tank dropping out on them, you can imagine why. Regular draining of the tank prevents sediment build-up. In the case of an electric hot water tank (1) first shut off the electricity to the tank (the breaker should be clearly labeled on your homes electric panel). If you have a natural gas hot water heater, to drain the tank, (1) first shut off the gas valve to the tank (make note of where the hot water tanks thermostat is currently set so you can dial it back to the same setting later), then (2) shut off the cold water valve feeding the cold side the tank. 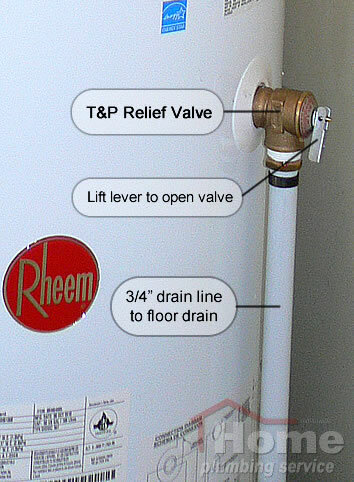 (3) Open the T&P (temperate and pressure) relief valve to allow the water pressure to drop and release a small amount of water into the floor drain. If your T&P relief valve isn’t adequately piped to your floor drain you might want to catch this water in a pan or bucket. (4) Attach a garden hose to the drain valve at the bottom of your tank and find a good place to drain the water (either in the floor drain by the hot water tank, or outside where you don’t mind a little muddy sediment discharge). (5) Open the drain valve and allow your hot water tank to drain. This should take about 20 to 30 minutes. If no water comes out of the drain valve, say “oh-oh” then call us. After the tank has been drained (6) turn the tanks drain valve off, and (7) the cold water valve back on. Your T&P relief value should still be open and is now being used to allow the air to escape as the tank fills. Don’t go anywhere! Your tank will fill in less than five minutes and when it does you need to be ready to (8) turn off the T&P relief valve so water doesn’t splash out everywhere. That’s it – your tank has been drained of sediment. Now you can (9) turn the electricity back on, or for natural gas, turn the gas valve back on, light the pilot, and turn the hot water heaters thermostat back to where it was set before. How often should you flush out your tank? Some manufactures say monthly, some say yearly, and some in-between. It really depends on the water hardness in your area. I'd recommend you flush your tank out every four months or so, adjusting over time as you see how clear the water is as you flush it. If the discharged water is always clear after four months, wait six months for the next service, etc. If you do regularly maintain your tank, say every four months or so, there is no reason to drain the whole tank and so you really don't need to shut the gas off. Just turn the cold water shut-off to the tank off, open the T&P relief valve, and drain out 5 gallons or so into a bucket or two from the drain valve at the bottom of the tank. As long as the water is coming out clean by the fifth gallon, you can consider the sediment removed, and you can close up the valve, close the T&P relief valve, and turn the water back on. The T&P valve on your hot water tank is a crucial piece of safety equipment that ensures that your tank does not get overly hot nor over pressurized. Either of these things happening equals bad news. Over time, scaling inside the tank can build up on the inside of the T&P relief valve hampering its ability to operate properly. There are several events that can happen to increase the pressure on your hot water tank. The worst case scenario is a dangerous increase in pressure as a result of runaway overheating (possible a faulty thermostat) combined with a faulty T&P relief valve. Think explosive steam. If you think this is happening, immediately turn off the gas and water supply to the tank. Call us out for an emergency service. Occasionally we've come across a home that has a faulty, or worse, no pressure reducing valve where the water comes in from the city service. At night when the fewest number of your neighbors are using water, the city water pressure in your area will go up. Perhaps the city is working on a service main somewhere resulting in a temporary increase in pressure. The T&P valve is always there to allow the tank some relief from pressure or temperature that would otherwise damage it. To be sure the valve will allow water to run through it, just open and close the valve a few times. It should, of course, let water through while its open, and successfully stop the water when its closed. If no water comes out when it is open or water continues to leak past the T&P valve while it is closed, then it is no longer functioning properly and should be replaced. In addition to draining the tank of sediment and checking the T&P relief valve, you might want to check to see if your tank has any filters that could use some cleaning. Some tanks employ filters at the bottom of the tank to filter out the air intakes for the combustion chamber. Others have filters on the top for power fan air intakes. If you find a filter, simply vacuuming the filter out nicely does the trick.